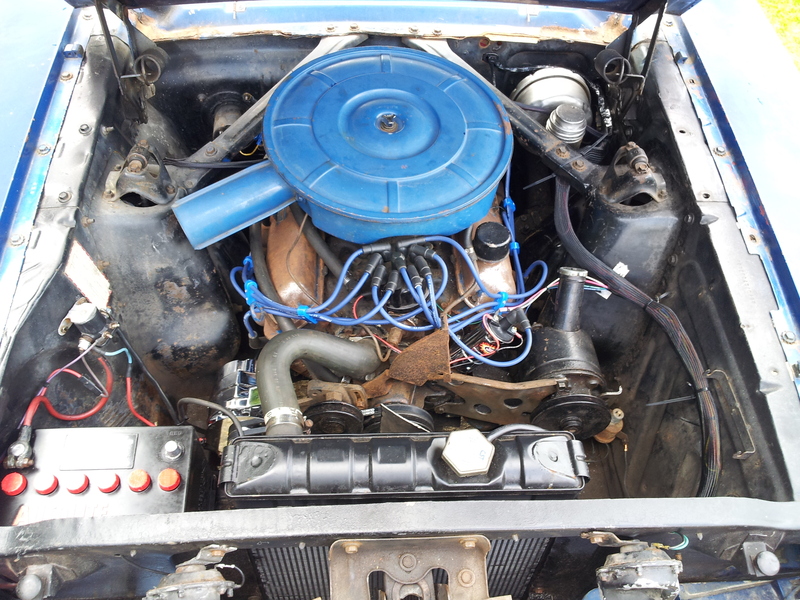 When I got the car I had a Holley 600cfm carb in place but no air pan fitted. Yes there was one in the trunk and great big blue one and looked original to me. When I tried to fit it there was no way it was going to fit. The pan is obviously for the original Autolite two barrel carb. That left me with the dilemma, get a proper four barrel pan or get a nice chrome job. It didn’t take long to think about, so I got the chrome pan you now see on the pictures under the hood. I tried to make it fit in various ways but it wasn’t having it at all. Up till now it has been stored in my man cave waiting for some attention. this is one of the few pictures I have of it in place, but it does not sit well at all. The pan has been hammered about and a big dent underside in order to make it fit. It sort of fitted but the air was going to get under the pan no matter what. The pictures here show the amount of damage involved. So the first job was to straighten out the pan to get it as flat as possible. I did this with a smallish hammer and the anvil part of my vice. It didn’t come out to bad but the metal was starting to tear a little so I decided that it would be the filler from now on. The paint needed to off completely as it was all flaking anyway. I used the POR-Strip to do that and it worked well. Click here for the POR-Strip Review. Once the pan was back to bare metal I would fill the ripples and get it back to smooth again. These pics are of the first spraying of the strip onto the paint. The first layers of paint we removed and the second application of the spray applied to get down to the bare metal. 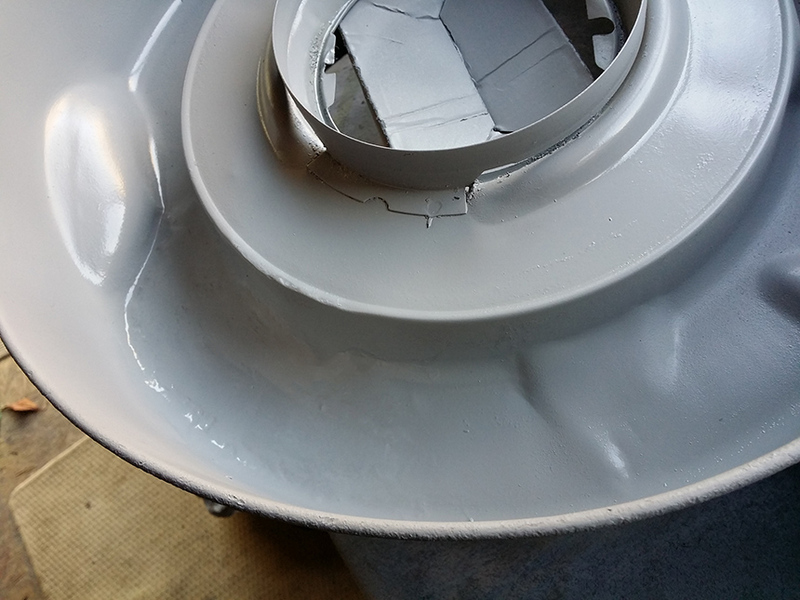 The paint fully removed from the air pan. 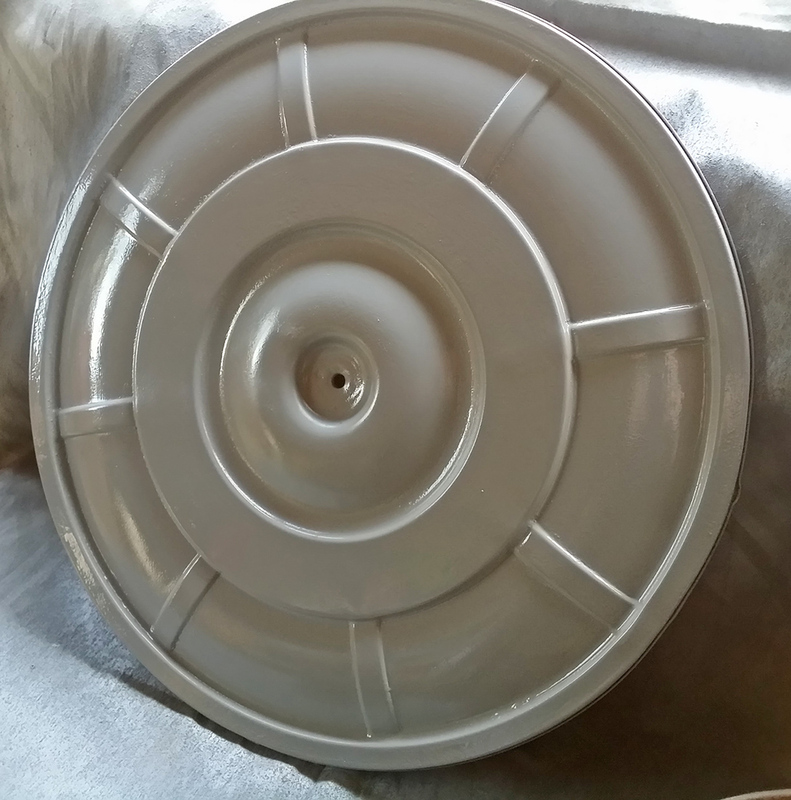 The lid of the air pan was rust treated with the FE-123 on the inside, and the first coat of the self etch primer was thinly applied. After the first coat had dried about fifteen minutes later then second coat was applied and repeated again for the third coat. While the paints were drying on the lid I applied some filler to the inside of the pan base and then flipped it over to do the underside. Two layers of the filler was applied in order to smooth out the area before sanding down. The snorkel was next as the filler was drying. Exactly the same principle was used to remove the paint and get down to the bare metal. The filler has dried overnight and I was able to sand down to a nice finish on the outside and pretty good on the inside. It, could be better but nobody if ever going to see it in there. Saying that it’s not bad at all and very passable. The snorkel was also treated to a couple of coats including the inside as well. Once the sanding was completed I cleaned it up and allowed to dry out again. The first coat was applied and allowed to dry. The second coat was applied after twenty minutes or so and the end result came out very well. Where the filler was I gave it an extra layers of thicker paint to cover some of the small imperfections of the filler. 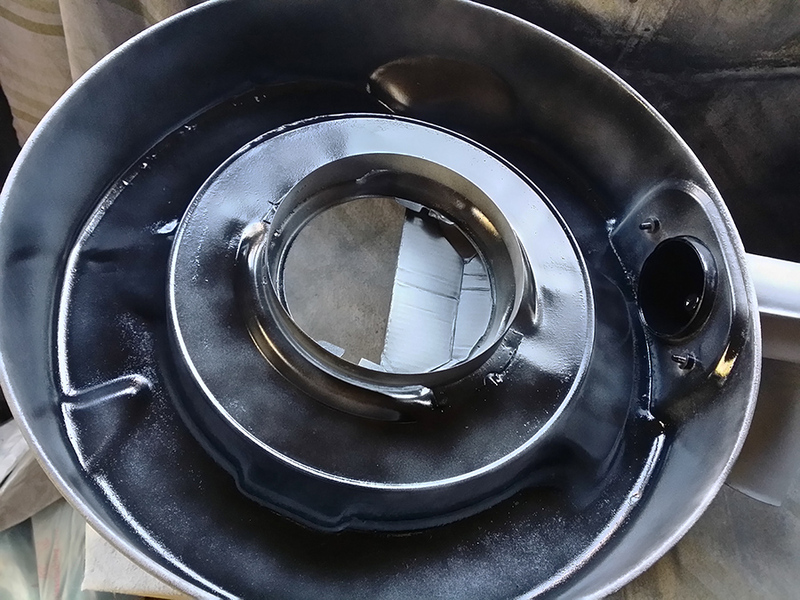 I left the extra coats of primer to set good and proper and applied the first coat of satin black to the inside of the pan. While that was drying I put coat inside the snorkel. A second coat was applied inside the snorkel before attaching back onto the pan base. The inside of the lid was given two coats while the other coats were drying on the pan and snorkel. Once both were dried I applied the second coat to the inside of the pan. The lid was added and touched up any slight overspray of black.